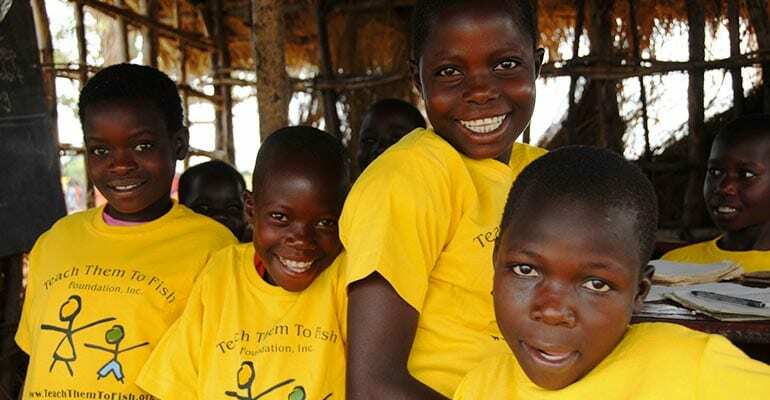 The Teach Them To Fish Foundation builds primary schools for orphaned and impoverished children in rural Cambodia and Uganda and addresses the importance of enabling girls at risk for human trafficking to attend school. One method we use in Africa to address the importance of enabling girls to attend school is regional radio commercials and programs. We air radio programing monthly. We design the programs to highlight the importance of allowing girls to finish their education. The talk shows typically have a parent, school, and district representative participate. The chat-show format allows officials to highlight gender awareness, child labor, early marriages, sexual health education, and the importance of sanitary towels in enabling girls to attend school – all of which infringe upon a girl’s right to be in school. We also have local celebrities on the program. Listeners have the opportunity to interact with the radio panel. In Kumi, near the site of our first school in Africa, for example, one father called in and said that he would add sanitary napkins to the family budget because of learning about their importance for the continuation of girls’ education during one of the radio shows. Another program topic included early marriages. We formatted this talk show to awaken parents of the need to maintain watch over their daughters during the long end of year school holiday. A common question often asked is how do people in rural Africa listen to the radio and call in? Radio is the fastest growing broadcast medium in Africa. Since people do not have cell phones, they go to stalls in local markets where they can pay a small amount to make a phone call to our programs. Many people do have access to radios. They generally listen to the radio socially, where there is a power source (for example, in a local market), as opposed to each household having one. Battery powered radios are the most common and cheapest. There are also a few wind-up radios. The programs are aired at scheduled times; and, we inform our schools of the schedules. There is also a side benefit to using radio. The listening area is greater than the area of our schools. Thus, we are able to help change the perceptions of people outside our schools as well for the same cost. Another method we use to encourage girls to attend school is by distributing sanitary napkins to girls free of charge. Girls do not have sanitary napkins to use at home. They use rags and leaves. When a girl starts her menstrual period, she stops going to school because of the risk of embarrassment among her friends. Families are aware of the problem. In the face of biting poverty, when for the price of a packet of sanitary towels you can buy three kilos of maize, one kilo of groundnuts, and one kilo of soya beans that will feed your family for a week, providing sanitary protection for girls is not a priority. Raising awareness of the importance of sanitary towels in enabling girls to attend school is the issue we also address in our radio commercials. A third method we use to address the high rate of absenteeism among girls is by ensuring girls have access to separate toilet facilities to save them the embarrassment of using the bush. In our schools in Africa, the average numbers of boys per latrine stand is thirty-nine, and, the average number of girls per latrine stand is thirty-five, a great improvement from the hundreds of children who used to share the same toilet. We also focus on educating teachers about gender awareness and introduced health clubs to teach girls how to say ‘no’ and from rushing into sexual relations which, alongside improvements in education, leads to increased health awareness, lower birth rates, as well as empowerment for girls, ultimately working towards reducing poverty. See also our article “When Girls Dream“.